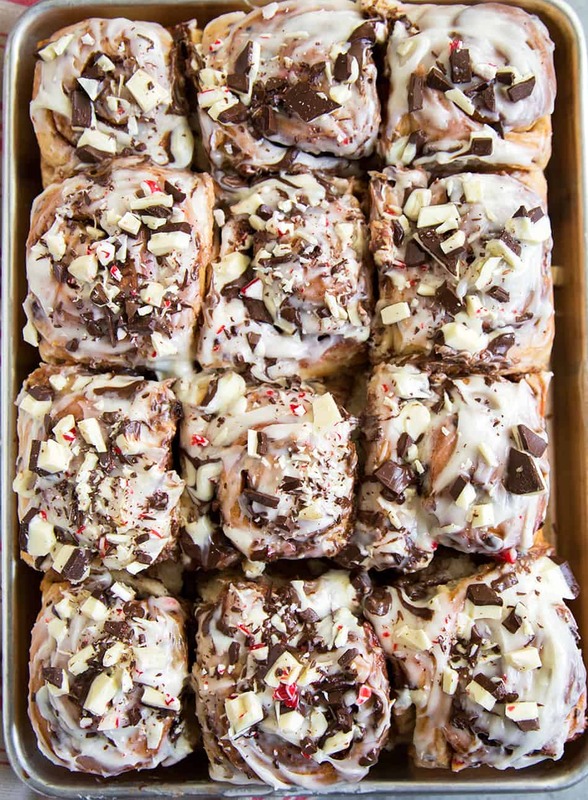 Peppermint Bark Rolls: soft bread rolls filled with cocoa-sugar and Peppermint Bark, glazed with cream cheese frosting, and topped with chopped Peppermint Bark! 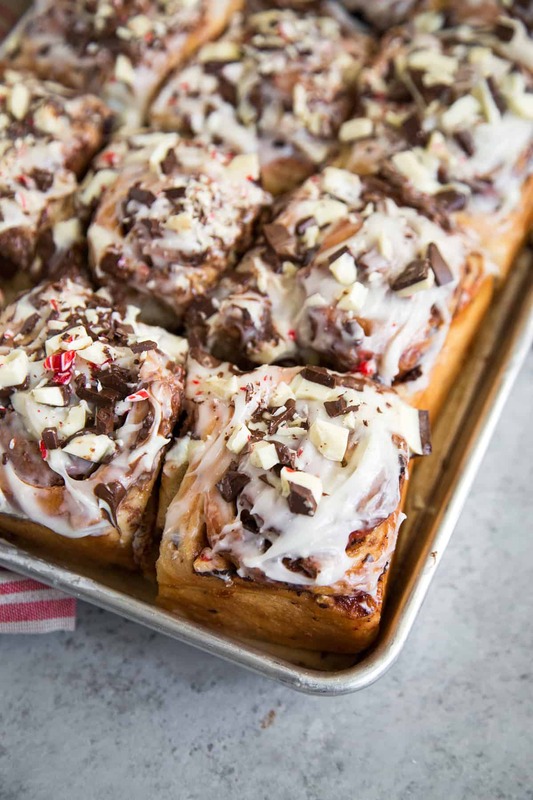 When Williams-Sonoma and TheFeedFeed asked me to create a recipe featuring my love (Peppermint Bark), I knew exactly what to make: Peppermint Bark Rolls. #BarkYeah! They’re like cinnamon rolls, but better. No cinnamon. All chocolate. 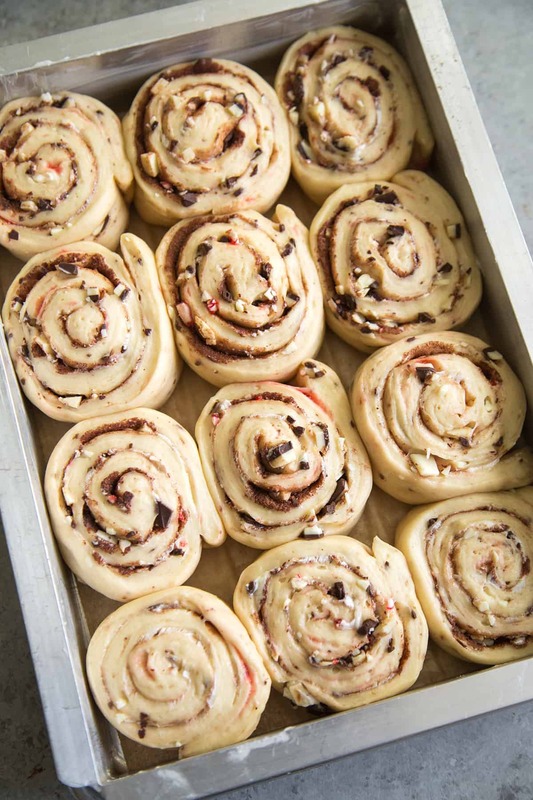 This recipe starts off like my favorite confetti cinnamon rolls. The dough is a straight forward yeasted mixture. However, during the final stages of mixing, half a cup of chopped Peppermint Bark is kneaded into the dough. 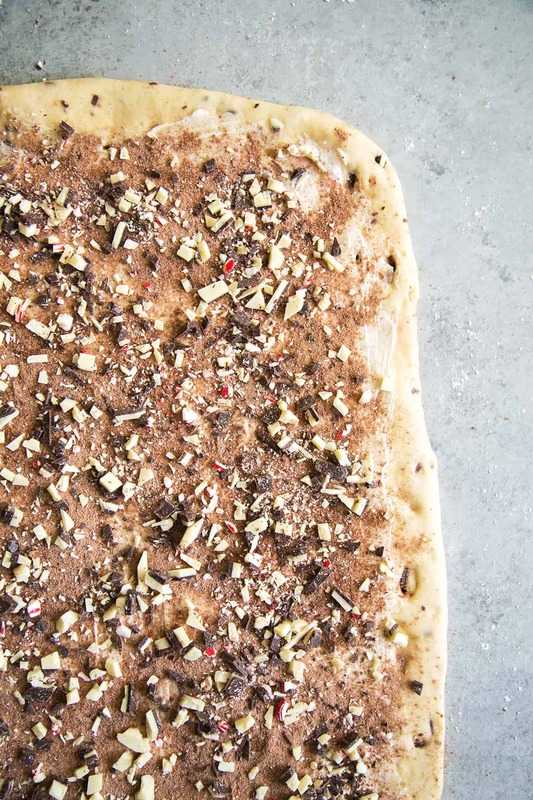 Can you see the little specks of peppermint and chocolate studded throughout the soft, fluffy dough?! The dough is rolled out into a large rectangle and coated with a layer of soft butter. Then comes the good stuff. Instead of cinnamon sugar, a cocoa-sugar mixture is dusted on top of the butter. 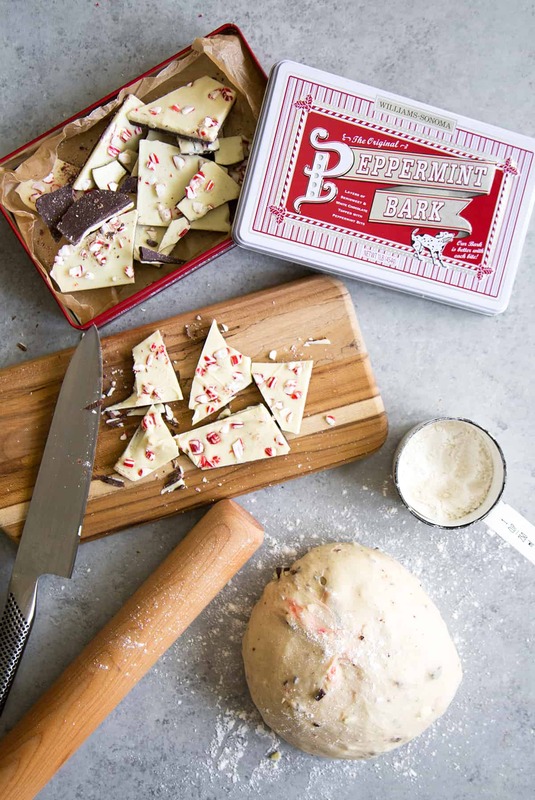 And finally, the part we’ve all been waiting for- finely chopped Peppermint Bark is sprinkled on top before the dough is rolled and cut into 12 slices. After much anticipation, once the rolls are baked and slightly cooled, it’s time to spread on the cream cheese frosting. If you’re feeling super festive, you can add a tiny amount of peppermint extract to make the frosting even more fun and tasty. Otherwise, leave it as is so you can let the Peppermint Bark shine on top. And there you have it. 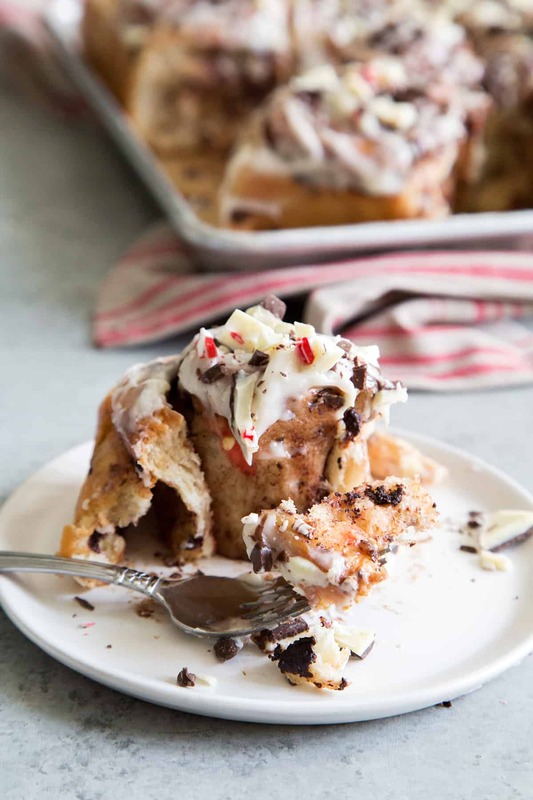 Peppermint Bark Rolls! In my opinion, the BEST way to enjoy bread and chocolate together during the holiday season (let’s be honest: all year long!). 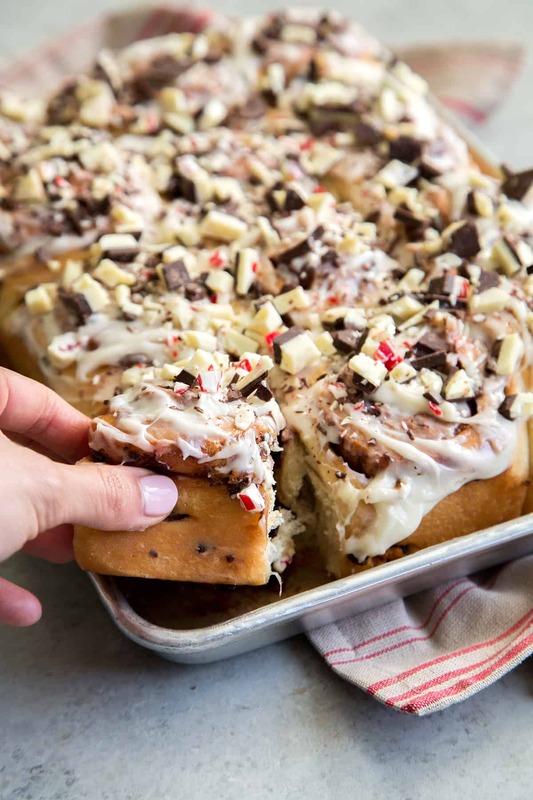 These soft, fluffy, and super tasty Peppermint Bark rolls are excellent way to kick off December and say farewell to another year. Whether you enjoy them for breakfast, snack, or dessert, it’ll definitely end with a satisfied belly and a big smile. Be sure to share these babies with family and friends. It’s a little dangerous to keep them all to yourself! In the bowl of a stand mixer, whisk together yeast mixture, remaining sugar, milk, egg, and egg yolk. Attach dough hook to mixer. these sound so delicious! love that there’s peppermint bark in and on top :3 the cocoa sugar inside the swirl sounds like the perfect complement to all the peppermint without being too much (i had a peppermint candy coated waffle cone the other day, and all i could taste was mint…). You combine two of my favorite things in one. HOLY COW. I’m freaking out over these rolls because they look SO INCREDIBLE. 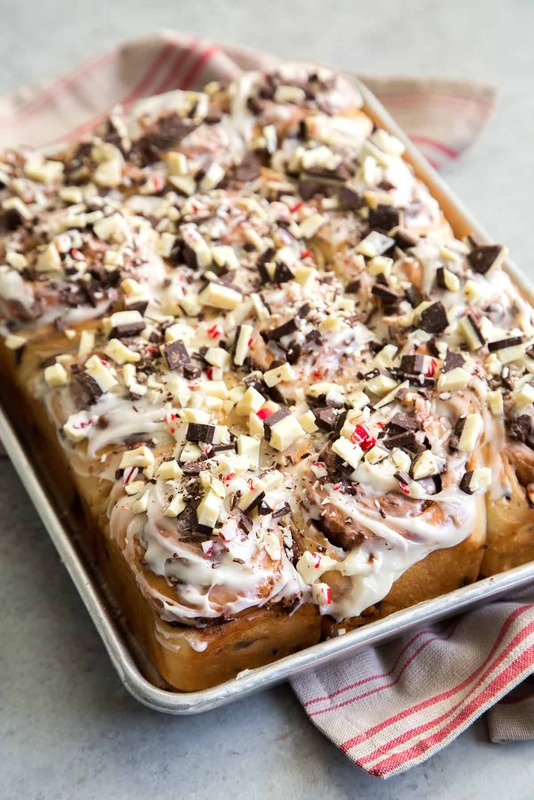 I’m a sucker for all things Peppermint Bark (and peppermint, in general), and these look like the best combination possible for Christmas breakfast. Pinning and cannot WAIT to make these beauties! Ooooh these are some decadent rolls! SO perfect for Christmas morning! Best use of peppermint bark I’ve ever seen!! These are Christmas morning heaven. I mean come on, does it get any better than fresh rolls AND peppermint bark? So amazing! 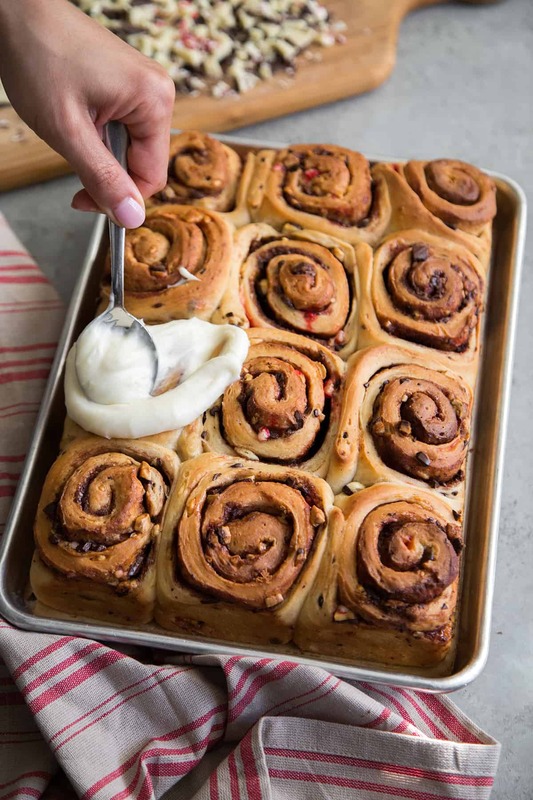 Holy Moly these have to be the best looking breakfast rolls. Absolutely holiday perfection! Hi! I just went to make these today and realized that milk is listed in the ingredients, but not included in the directions…..I left it out so hopefully they turn out ok! Thanks! Hi! Thank you for pointing that out. I have updated the directions. I list all the ingredients in the order they are used in the recipe. The milk goes in with the yeast when you add the sugar and eggs. The dough should turn out fine without the milk. They may be a little on the dry side, but the dough should still be tasty!